Kyoto is known as exotic sightseeing places and numerous historic, quaint old monuments are seen all over the town. This tour covers part of Rakutou (East district) and Central district. 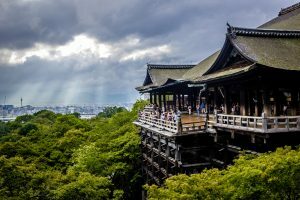 Visiting Rakutou, Gion, Yasaka-jinja shrine, Kodai-ji temple, Kiyomizu-dera temple are the most famous sightseeing spots in Kyoto. Particularly well known for the deity of love and marriage and consequently are often full of young couples around the year. Include Nishiki market, well known as “Kyoto’s Kitchen” that celebrates 300 years anniversary. Busy and full of crowds all year round in Nishiki market where you can find various kinds of fresh or traditional Japanese dishes for every day meals. In Gion, the center of Geisha community, you may or may not catch sight of Maiko (junior) or Geiko (Senior) hurrying to teahouses. Yasaka-jinja shrine hosts one of the three most important festivals of the year in Kyoto, Gion Festival in July. Ishibe-Koji alley (Stone wall alley) leads you to Kodai-ji temple from Yasaka-jinja shrine and next stone steps prolonged to Kiyomizu-dera temple through exotic and stunning beautiful Sannei-zaka slope. years employment in Japan. Dynamic tour guide who develops many different ways along with rich experience overseas to entertain large or small tour groups. Enjoys the interaction with tour groups, very strong group presentation and communication skills, finds each guest question as an opportunity to learn anything new. Constantly learning information about each tour spot to enhance tours. Since lincensed as a national tour guide in Feb 2015 and itinerary control manager in March 2016 by Federal Government (Ministry of Land, Infrastructure, Transport and Tourism) in Japan, had taken care of 6,500 foreign guests in total as of end of May 2018, across all over Japan extended to primarily Kansai district, also Hokkaido, Kanto, Chubu, Hokuriku, San-In, Shikoku district.